PaintCare Inc. Can You Repurpose Latex Wall Paint for Use On Wood Furniture? 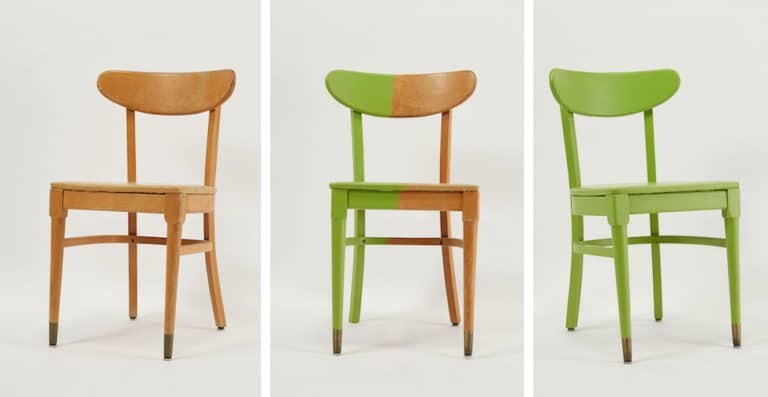 When it comes to repurposing old wood furniture, sanding is one of the most important steps you can take to make sure your project will turn out great. Sanding the piece of furniture you are about to paint ensures that it will have a smooth finish and that the paint adheres better and will not chip or flake off easily. Typically, if you are dealing with a piece of furniture that has a lacquer or other clear finish on it, start with 100 grit sandpaper. Once the majority of the paint or finish has been roughed up, you can use a higher grit. Then be sure to remove all the dust after sanding, as leftover dust could keep the paint and primer from adhering properly. Any latex paint color you’ve used on your walls can work for refurbishing wood furniture, but it is important to use some of that leftover primer first to get a smooth finish and cover well. Leftover paint can also be used as a primer. Priming has a huge impact on how your final product will look, and on how much paint you would need to use overall. If you are painting dark furniture a light color, use a light colored primer. If you are painting light furniture a dark color, use gray primer. You can use any latex paint on your furniture, regardless of the finish; flat, satin, semi-gloss and gloss all work well. The more sheen your paint has when it is dry, the more time you’ll need to allow it to dry between coats when you use it on furniture. Flat paint will adhere well to any prepared wood surface, and a second coat can be added as soon as the first has dried. Glossier paints require more time between coats to allow the paint to fully cure; allow one to three days between coats for best results if you are using a satin or gloss finish paint. For more information on the different types of paint finishes available, check out our Paint Finishes 101 blog post. Looking for more creative ways to reuse or recycle the paint leftover from your project? Browse our Use it Up Page for tips, trends and ideas for using up old paint!